And much of coaching, or even just conversation, is the exploration of those stories. Sometimes simply getting clearer on them, sometimes remembering what they are made of, remembering that they are stories. Since our entire experience of life is essentially through stories, through imagination, remembering and meaning, they play an important role in creating the life we want. 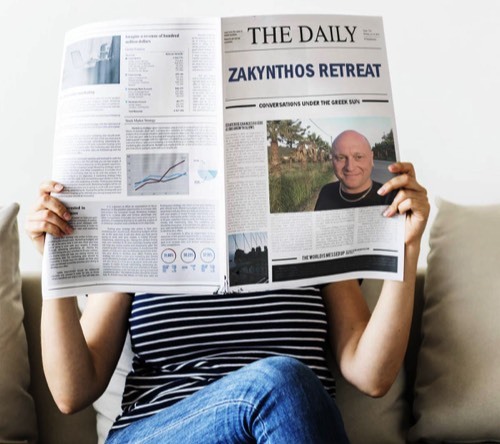 Some of the stories clients have brought to Zakynthos have included increased wealth, a dream job, moving into a dream home, creating a small business from scratch, dating, intimately reconnecting with a spouse, and creating a lifestyle with freedom to travel. All stories with a common thread of a more joyful and loving life. All these stories have come true, and it is that common thread of love and joy that enrols me in each one. The question is never ‘what do you want to create to bring you joy,’ life doesn’t work that way. It is always about exploring how dancing with life in the energy of love and joy can help you create whatever you want to create. Each story has been like a different cake brought to a party. Only the party has been walking along the beaches of Zakynthos and sitting overlooking the Ionian see with a fruit juice. There’s something magical about Zakynthos and exploring stories, creativity, love and joy there. Like most of us, I’ve always loved stories, (and cake 🍰) since I was a small child, and I’d love to explore what might be your story you would bring to Zakynthos? What cake would you bring to the party?